KANSAS CITY, Mo. (Reuters) - Record floods that submerged parts of three Midwestern states bringing death and destruction were retreating in Kansas City on Monday but icy tributaries in Montana and the Dakotas threatened more floods for weeks to come, the National Weather Service said. High flood waters have already returned in the western Dakotas, northwest Nebraska and central and eastern Montana, along smaller rivers that feed into the Missouri, David Roth, a meteorologist with the NWS's Weather Prediction Center in College Park, Maryland, said on Monday. Warmer weather makes the once solid river ice break-up into giant chunks, like mini-icebergs, Roth said. "The ice floats down river until it bunches up in what we call an ice-jam, like a dam, causing flooding," he said. "All that backed-up water is eventually going downstream," Roth said. "It'll come down the Missouri in a couple of weeks, and maybe hit Kansas City in mid-April." 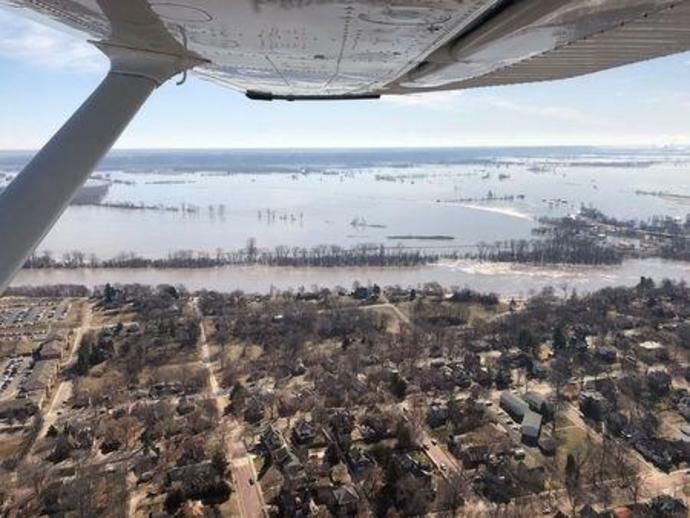 Midwest floods were unleashed last week after a "bomb cyclone" storm dumped torrential rains on hundreds of square miles (km) of the snow-covered Plains. The record flows cascaded down the Missouri, the country's longest river, killing at least four people, drowning livestock and closing dozens of roads in Nebraska and Iowa. Property losses were estimated at more than $3 billion in those two states. Those flood waters crested near Kansas City on Sunday, the weather service said. No further precipitation is forecast for the Midwest until midweek, when moderate rainfall is expected, NWS's Andrew Orrison said Sunday. "I think at the worst what it will do is just prolong the gradual receding of the water levels across the various river basins throughout the Midwest." The current flooding threatens Kansas City's drinking water. More than 600,000 customers in the Kansas City metropolitan area were asked to conserve water as flood-levels in the Missouri River created "treatment challenges," the city's water utility said on Sunday. But far up the nation's longest river, floods loom again. The Billings Gazette reported late Sunday that rapid snow melt drove ice jams on the Little Bighorn River, forced the shutdown of a stretches of major highways in eastern Montanta all the way to the Wyoming border. But the bigger threat is warmer temperatures that will hit the upper 60s in Billings by Tuesday and into midweek, driving more snowmelt that will eventually flow south, said meteorologist Roth. "All that water is still headed downstream," he said.